like the 45 record, mp3 is an enormous step down in audio fidelity compared to the source recording. What follows is an explanation and exposé of how mp3 affects the sound of recorded music. If you are a musical artist, things that affect the sound of your art may also affect your income. you paid for in the studio and struggled to achieve on your masters, is compromised. This is what your audience hears when they listen to you on an mp3 music player. 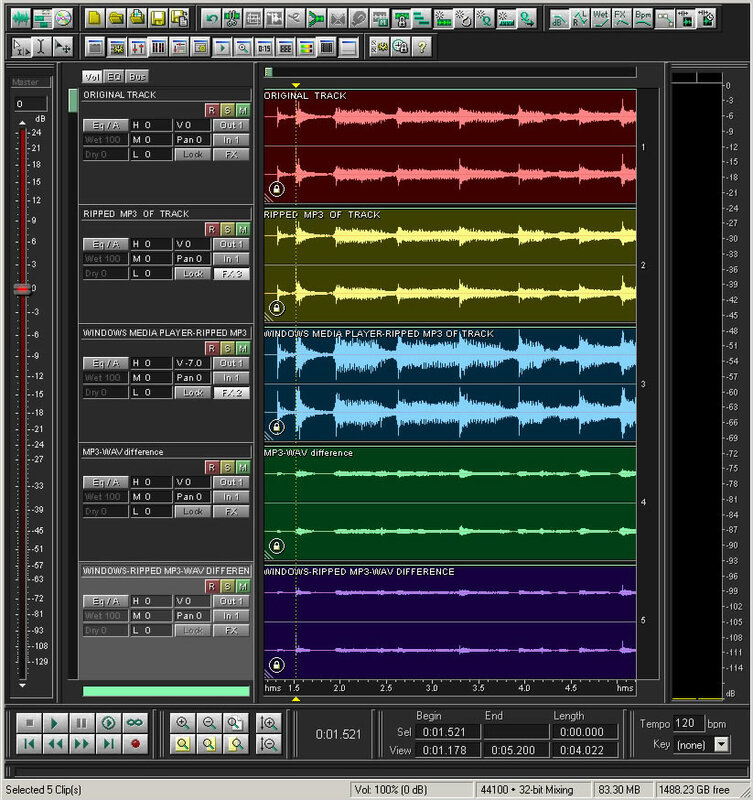 First the original track is placed in a multitrack digital audio computer workstation program as shown below in red. With volume levels of the original and the mp3 tracks exactly matched, mixing the two tracks together will leave only the difference between the two red and yellow tracks -- the mp3 subtracted from the original. If the two tracks are really identical, then no sound whatever will be heard from the mix of the two tracks. Listening to the difference green track gives us two pieces of information -- the volume of the difference, and the nature or "tone" of that difference. The difference track then, is the sound of what is done to the original signal in the process of making an mp3 out of it. One might argue that this difference is the result of subtraction—subtracting the mp3 from the WAV, but it is also ADDITIONAL sound in the form of distortion, that is added into the sonic end result, since the ear cannot distinguish between distortion that is added or subtracted. As you will hear, the difference is a disgusting abomination, and clearly something no one in their right mind would willingly pay for with hard-earned money knowing the hidden truth in advance. This screen shot shows how the original and the mp3 were carefully aligned--accurate to the individual digital audio sample--to remove errors due to track timing. The "FX2" box highlight reflects the use of a polarity inversion applied to the mp3 track. Polarity inversion merely flips the audio wave form upside-down so that it will cancel out totally. Two identical sound files treated this way (e.g. if we used two originals), when mixed together (to make our green result), would produce a track of total silence. The reason that the third green subtraction track is not silent is because of the differences between the original and the mp3 tracks. 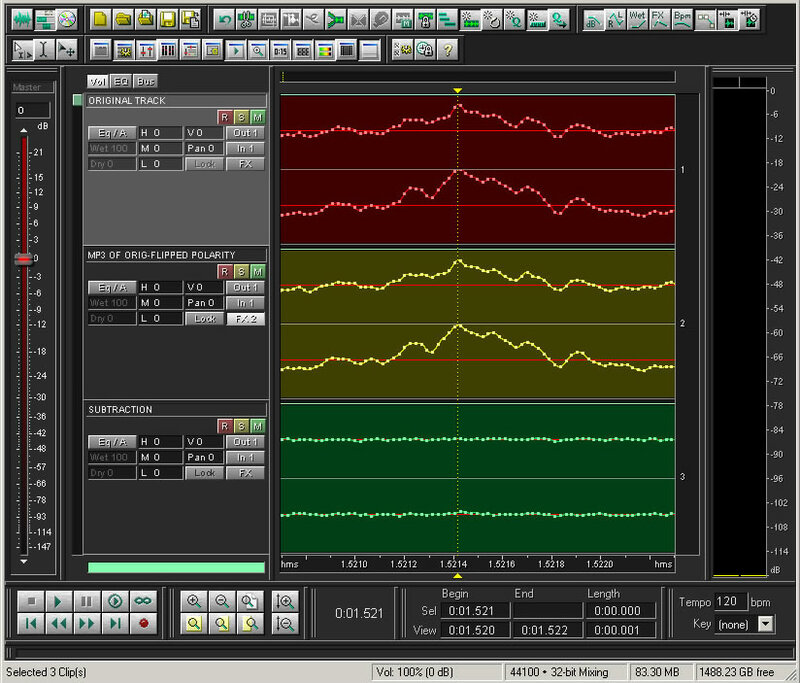 this full clip view of the files shows just how much relative amplitude exists in the difference signal. conversions available. There are many programs and many devices to make or play mp3s. 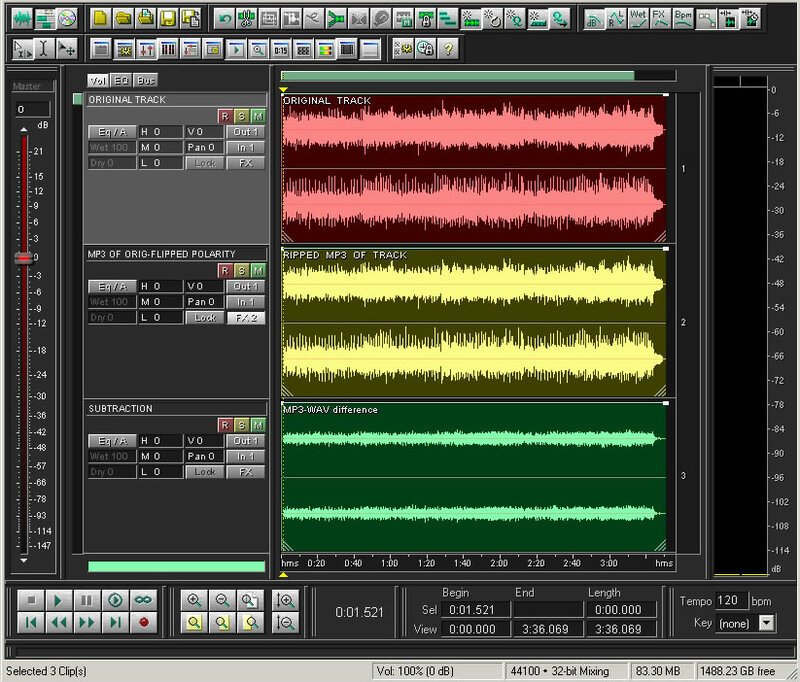 obnoxious difference and adding even more distortion to the resulting mp3 files. To hear the original track, click HERE (3.1 MBytes). To hear a 320 kB/s mp3 track, click HERE (3.1 MB). To hear the 320 kB/s difference (the damage) track, click HERE (3.1 MB). To hear a 128 kB/s mp3 track, click HERE (3.1 MB). To hear the 128 kB/s difference (the damage) track, click HERE (3.1 MB). "If bad audio were lethal, we'd all be dead." Welcome to the world of "to hell with quality, all we care about is PROFITS!" We are losing our musical heritage to cynical, greedy mp3 commercialism. because it has no value. After all, how can stuff that sounds that way have value?